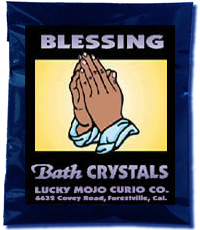 On this blessed Friday, January 17, 2014, the Lucky Mojo Curio Co. is hosting Facebook Fridays! 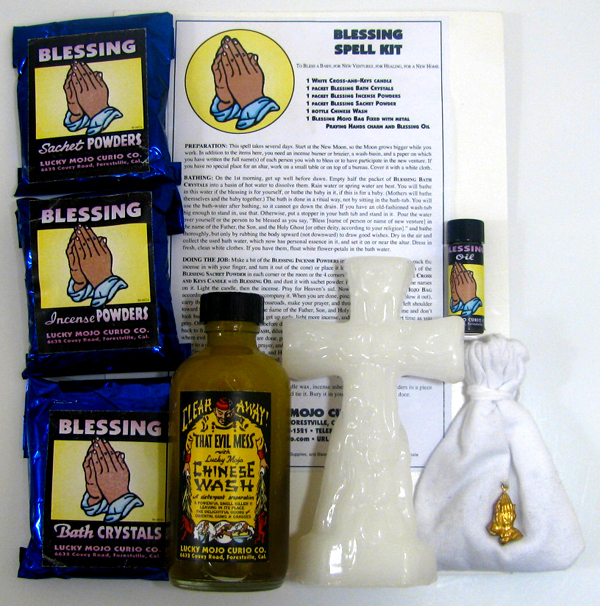 -- a random drawing to give away four different Blessing spiritual supplies -- a Blessing Spell Kit, a fixed and prepared Blessing Bottle Spell, a bottle of Blessing Oil and a packet of Blessing Bath Crystals. All you have to do to enter is to go to the Lucky Mojo Facebook page, scroll down, and post a comment to the Facebook Fridays! status message for Facebook Fridays! : January 17, 2014. At the end of the day, we will select 4 winners at random, announce their names here, contact them via Facebook to get their mailing addresses, and send them their FREE Blessing products. We have a winner! In fact, we have FOUR lucky winners! Our Facebook Fridays Giveaway winners for January 17, 2014 are: Jen Lee, Tom Jenkins, Coral Anderson and Gray Bear. Thank you, Ernie and Katrina -- and congratulations to our winners.